Our Airbnb in Bridgewater, Vermont was one of the more unusual places we've stayed. There hadn't been anything available in Woodstock, the main town in the area, so I picked the closest house about ten miles east. The road the house was on turned out to be a steep and winding gravel drive that led up the mountainside directly off the highway. I was a little nervous about the weight of our car with its occupants but the minivan navigated the slope without any difficulty. The house was a lodge-style building whose bottom floor was being renovated, and we had the entire upper floor to ourselves. There wasn't another house in sight, only trees. The interior was decent except for the fact that electricity was only working on one side of the house. Apparently the contractors had done something to disrupt the power supply to the other side while doing the renovations below. After dropping off our bags, we headed straight for the Quechee Gorge. A receding glacier cut this canyon into the earth thirteen thousand years ago, and now it's one of the most impressive natural sights in New England. We parked outside the little cluster of tourist shops on the far side of the gorge that calls itself Quechee Gorge Village and walked back to the bridge on Route 4 for the views. We took a short walk down one of the trails to the bottom of the gorge, but decided not to overdo it considering we had a dinner reservation not too far off. The kids enjoyed the chance to stretch their legs and see some nature. Back at Quechee Gorge Village we checked out the souvenirs and tasted some liqueurs that were made locally from maple syrup and black currants. The next morning we had a classic New England breakfast at Mon Vert Cafe in Woodstock before heading over to the Vermont Institute of Natural Science. Despite its intimidating name, VINS is a very friendly outdoor raptor rehabilitation center with extensive nature trails. We had an hour to kill before the next raptor show so we explored one of the shorter trails, which was still a good workout for the kids. They made enough noise that we were guaranteed not to see any wildlife larger than a beetle. The kids weren't enthralled with the raptor show, although I enjoyed the rare opportunity to see these beautiful and powerful birds up close. The kids preferred the part at the end where they got to handle the disassembled parts of the birds that ultimately hadn't made it. In the afternoon we took the kids to Billings Farm, a working dairy farm with plenty of large animals as well as an impressive museum of American farming. Unsurprisingly, the kids were most impressed by the ongoing bodily functions of the cows and the corresponding odors. The next morning we stopped briefly at Simon Pearce, a boutique glassblowing studio and restaurant on the bank of the Ottauquechee River. The site was once a mill, and until recently the furnaces operated using hydroelectric power generated by the original dam and waterfall. The restaurant is perched over the waterfall with a view of a classic Vermont covered bridge. On the way out of the Quechee area we visited the Montshire Museum of Science, which had enough exhibits and activities to keep kids entertained for hours. We only planned a short stop but the kids were having so much fun that we ended up staying most of the afternoon. En route to Burlington we crossed the Lincoln Gap Road , which traverses the Green Mountain range. It has a reputation for being the most scenic of the roads that pass through the mountains, but honestly there wasn't much to see from the road itself although it was a pleasant winding drive. The best time to drive the road is probably in September and early October when the leaves are changing and before the road closes for the winter season. I was amazed by the number of houses on the gap and wondered how their inhabitants survive through the winter when the snow piles up and the road is closed. I learned later that the road is only closed to non-residents and is actually plowed regularly. Burlington is a pretty small city but after the tiny towns we'd visited over the last few days it seemed positively cosmopolitan. We passed the attractive, sprawling campus of the University of Vermont and arrived in the Old North End. Our Airbnb was the upper level of a fairly nondescript two-story house with an outdoor staircase. It was Cleo's actual birthday and we decided to mark the occasion at Burlington's best known restaurant Hen of the Wood. We'd already had her birthday party in Miami before we left, but those kids' parties are so frenetic there was no opportunity for us to sit back and reflect on everything that had changed in the six years since she was born. We had a good meal in the cheerful bistro, although there wasn't anything on the menu that was particularly unique. It was nice to have a little time to focus on Cleo while her exasperating little brothers were at the Airbnb with their Grandma. We had a full slate of activities for our day in Burlington. After a classic Vermont blueberry pancake brunch we drove half an hour to Waterbury for the semi-obligatory Ben and Jerry's tour. As I expected, it was underwhelming although the kids had fun. The highlight for me was making the tour guide squirm by asking if there were any plans for a Donald Trump-themed flavor. Perhaps Orange Cheesecake? Next up was Shelburne Farms, our second farm in three days. The visit began with a wagon ride across a surreal landscape of tightly cropped grass dotted with cylindrical hay bales. The main building looked more like a Gothic castle than a farm. There was a lot more hands on activity for the kids at Shelburne Farms than at the farm in Woodstock. There were donkeys to brush, chickens to feed, and plenty of old farm equipment in the spacious barn. We had to rush back to Burlington to drop off Spenser with Grandma, as he was too young for our afternoon sailboat cruise on Lake Champlain. The Friend Ship was operated by the Whistling Man Schooner Company, although technically it was a sloop rather than a schooner because it had only one mast. The friendly captain gave Ian a quizzical look and asked us how old he was. I couldn't remember what the minimum age had been when I'd booked, so I quickly said he was five before Cleo could answer, even though he was still a couple of months short of his fifth birthday. Cleo gave me a quizzical glance and I looked daggers at her, and fortunately she had the presence of mind to keep her mouth closed. The captain said something to the effect of Ian just making the age limit and we set off. We spent the next two hours enjoying a peaceful sail on Lake Champlain, enjoying the banter and interesting stories of our captain. I learned that rather than flowing south into the Hudson River, Lake Champlain actually drains into the St. Lawrence river which takes an unusual northerly course to the Atlantic. The kids clambered up onto the roof of the cabin and I watched them nervously expecting them to be chucked into the ocean by a sudden swing of the boom, but fortunately they kept their heads down and made it back to the dock with us. Sad to say, there were no sightings of Champ, Lake Champlain's answer to the Loch Ness monster. We went straight to dinner at a surprisingly good Moroccan restaurant at the southern end of pedestrianized Church Street. After dinner we slowly walked the four blocks north to the Unitarian church that gives the street its name, taking in a colorful array of street performers, local characters, and sculpture. We couldn't bring Grandma into Canada because of visa issues so we'd arranged a hotel for her in Plattsburgh, NY for the three days the rest of us would be in Montreal. The Plattsburgh stop gave us a reason to cross Lake Champlain via South Hero island, the most heavily settled of the three populated Lake Champlain islands. Most Americans aren't aware of the existence of these unusual, remote lake islands but aside from their rural charm they also have great historical importance as Revolutionary War battlegrounds. We had a very enjoyable drive over the causeway to the island and then through empty country roads to Snow Farm, a vineyard and winery at the southwestern corner of the island. Just before we reached the island, we noticed colorful birdhouses starting to appear on the trees on the inland side of the road. More and more appeared and eventually we passed a thicket where it seemed like there was a birdhouse attached to every single tree. We stopped the car for a closer inspection and saw the little wood was also populated with very lifelike dinosaur models. We drove on further and eventually found a sign explaining the reason for the birdhouses, along with an array of birdhouses for sale via an honor system. 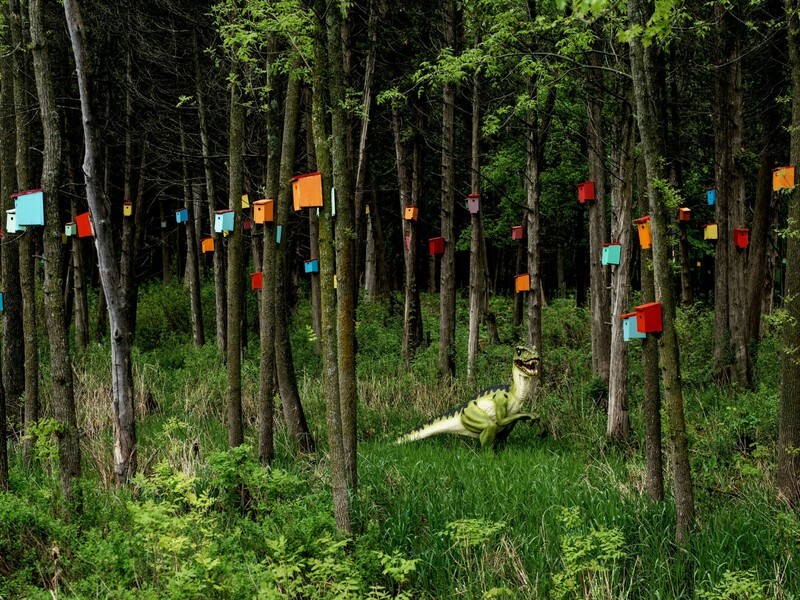 We didn't get a good picture of the birdhouse forest, so I scraped one from the New York Times. We were the only visitors at the winery, but we were attended to very pleasantly and enjoyed a tasting flight. I was a little confused as the grape varietals listed for the red wines had completely unfamiliar names such as Baco Noir and Catawba. Later I learned that they are hybrids which are grown to make wine pretty much exclusively in the northeastern US and Canada. The splendid isolation of the little winery and vineyard on that overcast day in the Lake Champlain islands is one of my best memories from the trip. We took the car ferry from South Hero to Plattsburgh and dropped Grandma off at her hotel with three days of food supplies. We didn't have much in the way of expectations for lunch in Plattsburgh, but TripAdvisor led us to Anthony's, a surprisingly upscale and authentic French bistro where we had one of the best restaurant meals of the trip. During our lunch, Cleo asked me why I'd told the boat captain that Ian was five when he was still only four. That led to a very frank discussion about how sometimes people do lie when they're sure that no one will be hurt because of it. I used the example of when your friend asks you if you like her new dress, and you say that you do even though you think it's ugly. As we were finishing our lunch, an elderly lady came over to the table and told us she overheard our conversation with Cleo. Here we go, I thought, preparing myself for a stern New England lecture on child-rearing. But as it turned out, the woman wanted to tell us she was a retired schoolteacher and strongly approved of the way we taught Cleo about life's little realities. Go figure. We paid our compliments to the chef and piled back into the car, excited for our next stop in Montréal.